What Keeps a Long Term Relationship Together? Discuss new ideas to add excitement to your date nights. There may come a time when your relationship begins to get boring and you find you and your sweetie are stuck in a rut. Instead of calling it quits, save your failing relationship by talking things over and thinking of fresh ways to reconnect. Several discussion topics can combat the boredom blues you both are experiencing and bring back the fun to your relationship. Reminisce about what made you a couple in the first place to combat boredom. Revisit locations significant to your relationship. Being in these places can trigger pleasant memories for both of you, explains psychologist Stephanie Sarkis in the Psychology Today website article "6 Ways to Re-Ignite Your Relationship." While at each location, discuss how you fell in love from the early stages up until now. Talk about your first kiss, your first date and how you met. Dig deeper into each other's lives to find out something you never knew before. Feeling like there is nothing new to talk about can put you in danger of becoming detached and disconnected, according to certified sexuality counselor Ian Kerper in the Your Tango website article "6 Ways To Beat Boredom in a Relationship (And Why It's Important)." Skip questions such as "How was your day?" Instead, ask unusual questions to each other, such as "What was your favorite toy to sleep with as a child?" or "What country have you always wanted to travel to?" Discuss what you admire about each other to realize things between the two of you are not so boring after all. Emphasize what you appreciate about your sweetheart and why you are still in love, says Sarkis. Talk about the physical and personality traits that make your relationship worthwhile. Perhaps you can tell your girlfriend how her beautiful smile melts your heart everyday or let your boyfriend know how his great sense of humor always keeps you laughing. Reveal any admired quirks, such as the way she twirls her hair when talking. A relationship may seem boring because you and your paramour spend entirely too much time together. 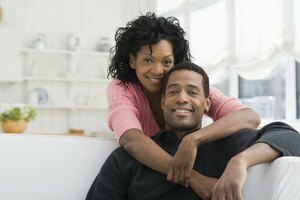 The balance between staying connected and separating can help your well-being and benefit your relationship, according to psychotherapist F. Diane Barth in the Psychology Today website article "Spaces in Your Togetherness?" Discuss ways you can give each other a little distance and ultimately help bring freshness to your relationship. Perhaps each of you can find new hobbies to do individually. In future conversations together, you can report what you learned and interest each other in the hobby. Psychology Today: Spaces in Your Togetherness? How Can I Stop Obsessing Over a Guy Who Doesn't Even Notice Me? Taylor, Wannikki. "Things to Talk About When the Relationship Seems Boring." Synonym, https://classroom.synonym.com/things-talk-relationship-seems-boring-17019.html. Accessed 18 April 2019.